Rates should be increased by 5.0000 % for government Taxes. 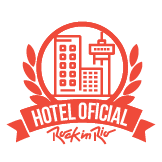 The Atlantico Sul Hotel is located at 40 km from the Santos Dumont Airport and from the Rio de Janeiro Bus Terminal. The Galeão International Airport is 43 km away from the hotel, while the city center of Rio de Janeiro is at 50 km from the Atlantico Sul Hotel. Distance from the venue and the Atlantico Sul.